King not to revoke Acts. 3. The Bill for Tin-work in Devon. - Jud'm. 1. The Bill to repeal the Act, that the King may revoke Acts of Parliament. 1. The Bill for Tannes, and Bark. L. 1. 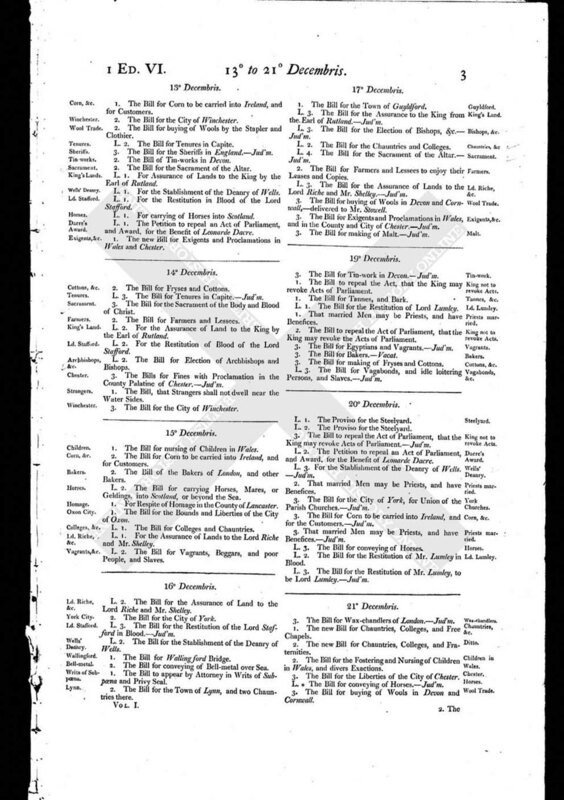 The Bill for the Restitution of Lord Lumley. 1. That married Men may be Priests, and have Benefices. 2. The Bill to repeal the Act of Parliament, that the King may revoke the Acts of Parliament. 3. The Bill for Egyptians and Vagrants. - Jud'm. 3. The Bill for Bakers. - Vacat. 3. The Bill for making of Fryses and Cottons. L. 3. The Bill for Vagabonds, and idle loitering Persons, and Slaves. - Jud'm.